I was never a big fan of scalloped potatoes growing up. I had a thing about mushy food, so that's probably why I didn't appreciate them. As with so many things, my tastes have changed over the years. It also helps that I am making my own recipes so I know what goes into them and can appreciate the finished product more. This is not a simple weeknight recipe, but it's not that complicated and the results are definitely worth the effort! This is the perfect choice to serve with ham, and I'm going to halve the recipe for Easter dinner for two this weekend. A large gratin dish is great for this recipe, or you can use any glass baking dish. I find that slicing the potatoes in the food processor with the slicing blade really simplifies things. But you can slice by hand or on a mandoline if you prefer. It just takes more time. The important thing is to have thin, even slices of potato. 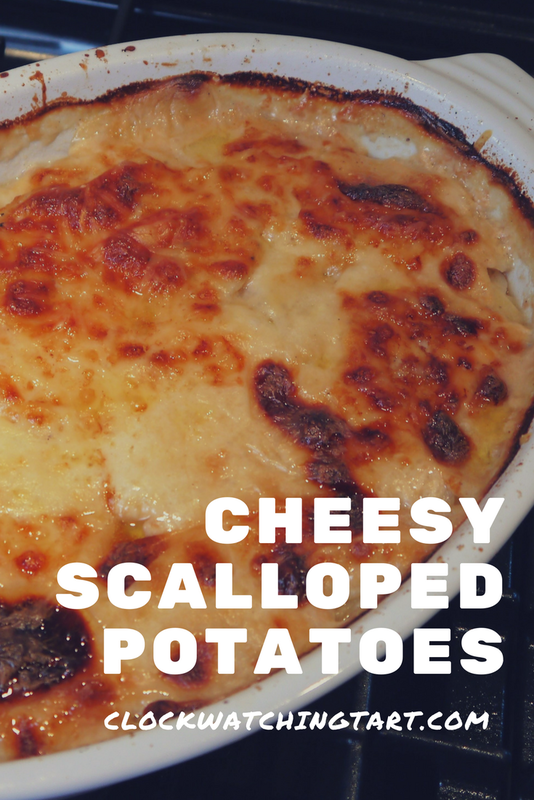 The potatoes are boiled in milk, then placed in a buttered gratin dish. I like lots of black pepper. The potatoes are then covered in the scalded milk and shredded gruyere cheese, then baked until brown and bubbly. The cheese gets shredded in the food processer too, to make life easy. You end up with these amazing, creamy, cheesy potatoes. The crispy edges are the best part! Peel and thinly slice potatoes using a food processor with the slicing blade or a mandoline. Place potato slices in a large pot and cover with milk. Bring to a boil over high heat, then lower heat and simmer for 3 minutes. Occasionally gently scrape the bottom of the pot so the potatoes don't stick, but be careful not to break up the potato slices. Drain the potatoes in a colander over a bowl to reserve the milk. You should have 2 cups of milk remaining. If not, add additional milk to make 2 cups. Use a large oval gratin dish or rectangular glass baking dish. Slice the garlic clove in half and rub the cut halves all over the inside of the baking dish. Brush the melted butter all over the inside of the dish. Carefully layer the potatoes in the baking dish. Sprinkle each layer with salt and pepper. Pour milk and cream over potatoes. Top with shredded cheese. Bake for about 90 minutes until milk has become creamy and thick but not dry, and cheese is deep golden brown. If the cheese begins to become too brown, you can cover the dish loosely with foil to finish cooking. Let sit for 10-15 minutes before serving. I suggest serving with glazed ham.